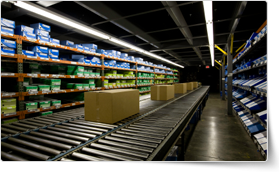 Effective management of inventory ensures that demand is met, costs reduced and errors minimized. To develop new skills in managing supply chain, consider joining Supply Chain Management Training Course by pdtraining delivered in Miami, Orlando, Philadelphia and other cities in the U.S. Inventory management includes the management of end products, raw materials, quality control, management of space and time, tracking, cost control, and the estimation and control of carrying costs. From managing the physical space that raw materials, end products and human resources will share, inventory management involves the movement, tracking and managing of resources and activities that end with the end product reaching the market. A primary step in the optimization of inventory is to manage orders. If a company receives orders from various sources such as the Internet, call centers and stores, it needs to be ensured that all orders reach the company in time. To manage orders, a company may use software or create systems that allow them immediate access to the orders from all sources. Many companies monitor and control their inventory by each item. Through such a method, companies can track each item, know the history of supply and management of each item, and predict future demand to some extent. This method is mostly used by retailers to manage inventory. When it comes to manufacturers, they are more concerned about the production and may use inventory management in scheduling, monitoring and controlling production. Inventory management is heavily impacted by demand and is linked to customer satisfaction. If there is expected to be a rise in demand for a particular product, the supply will need to be increased. With changing demand, the scale of ordering, raw materials, supply, end products, the space required, and the human resources needed changes. To accommodate the change and ensuring customer satisfaction, effective management of inventory becomes crucial. Superior inventory management helps to match customer’s expectations with the supply of the end product. For instance, if a customer demands a steering wheel cover from a manufacturer and there is no availability of it at the store, business will be lost. Therefore, availability of the product is essential for customer satisfaction, and inventory management ensures that there is no gap between supply and demand. Inventory management is a crucial step towards overcoming uncertainties in demand and supply, reducing costs, and ensuring that customer satisfaction is maintained at all times.